It has been a sort of clean up weekend. Tegan has been working hard, weeding in the back yard flower beds. I got the grass cut today once the weather cooperated. Also, I cleaned up around our computer desk and recycled a lot of old papers and stuff cluttering up our filing cabinet. Tegan also got a lot of clothes shifted from the basement up to the bedroom closets and moved tubs of clothes out of bedrooms and down into the basement. Ariel kept herself occupied this afternoon by creating another interesting bit of artwork. You can see it below. It is hard to see here, but it consists of several small pieces of paper, each individually featuring an animal and taped to a larger piece of paper. 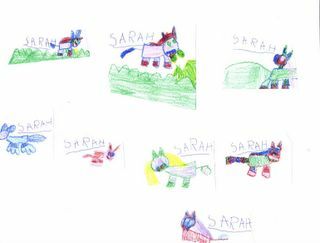 Why she chose to write Sarah on each piece of paper remains a mystery. Those in the art world would say that Ariel has now shifted into what is known as "mixed media." It won't be long before she is crafting small models of the Bilbao Guggenheim and other amazing things that will make her famous but earn her little money. But, maybe she'll be famous as an actress or as a "wire-actress." Don't believe me? Then check out THIS photo (sure to embarrass her when she gets older). This beauty was taken when she was playing at a friends house a few weeks ago. 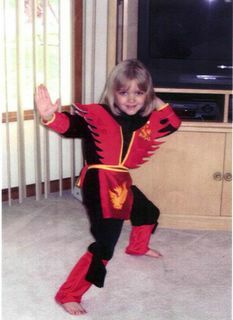 Where she learned to mimic the beauty and grace of martial arts experts, I don't know. But let this be a lesson to you all. If you try and cross me, I'll send Ariel to go Matrix on you. Ariel's form is excellent, from a taiji perspective. The training stance she ably demonstrates in the photo is called "Supporting the Sky," and her weight is nicely back in the left leg with right leg and arm extended. Okay, maybe a little more space between the fingers would be good, but that's a quibble. And where can I get a red tunic like that? !